Complete set of all 20 novels, in the original trade paperback bindings by W.W. Norton. Also included is the unfinished “21”. 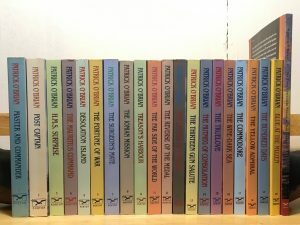 O’Brian is probably the most popular author in our “Shot and Sail” section. These are often read by people who’ve already read all of the Horatio Hornblower novels by C.S. Forester, which is another great series. This set is not for the collector–we don’t have a full set of first edition hardcovers right now–but for the reader. We normally price these around $7 each in the store, which would be about $150 total, but we’re offering this set at a reduced price as a package deal!